Hsien Feng Year Official cover, unused, water stained at upper right. F-VF. Rare. 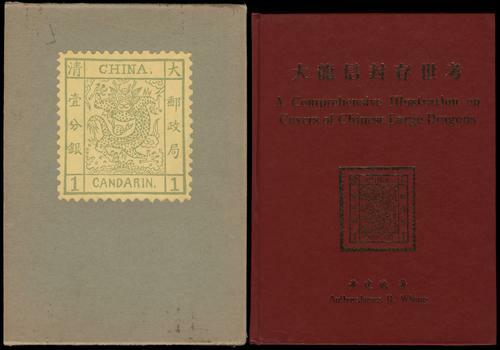 1910s 2 red band covers of Japan and Britiain Embassy in Peking, sent to Ministry of Foreign Affairs. VF. 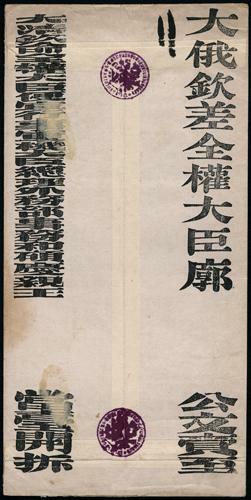 1909~1911 Large official cover from Russian Legation (Mr. I.J.Korostovetz) to the Prince Ching of Ministry of Foreign Affair in Peking,  two purple seals applied on front. 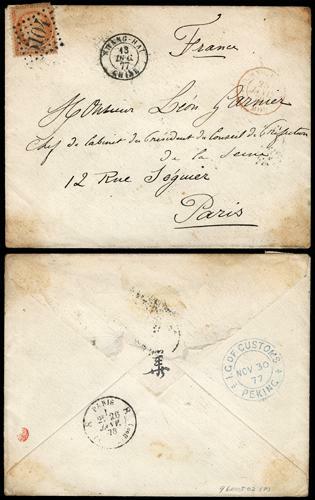 VF-F.
1877 (Nov 30) Peking to Paris cover, via Shanghai, bearing on backside I.G. of Customs Peking originating cds. in blue, on front f.w. 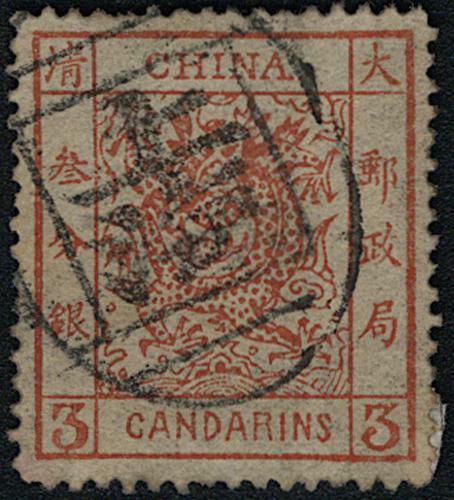 French Issue 40c, tied by Shanghai "5104" obliterator, along with Shanghai French PO cds. and red French transit. Paris arrival on reverse. 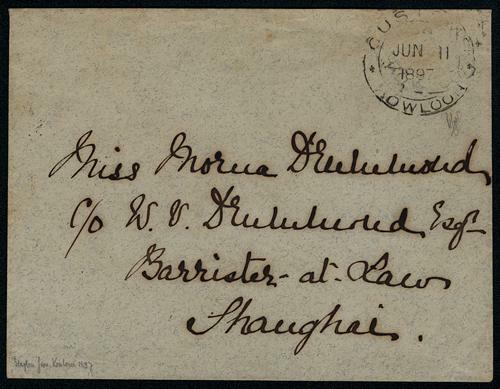 VF-F.
1897 (Jun 11) stampless cover from Kowloon to Shanghai, bearing at upper right a clear and rare CUSTOMS KOWLOON cds., on reverse with Shanghai Dollar arrival cds., and delivery instruction in red crayon. 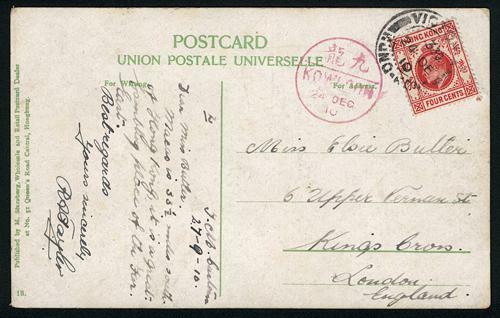 VF-F.
1910 (Dec 24) Hong Kong to England picture postcard with KOWLOON bisected cds., f.w. 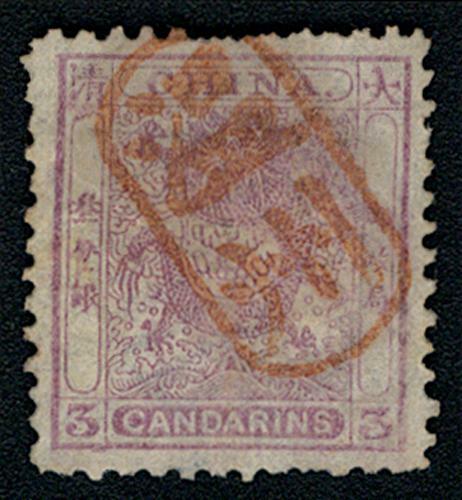 KEVII 4c stamp, tied by VICTORIA cds., along with very rare KOWLOON bisected cds. in red. Illustrated in Paul Chang, Vol. I, p.360. 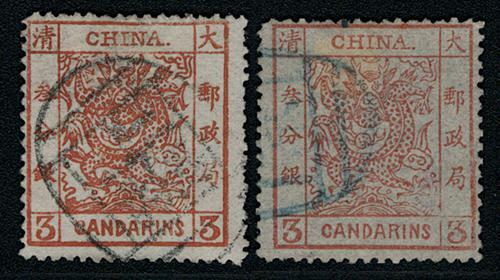 1878-83 Large Dragon Thin Paper and Thick Paper Clean Perfs 3Cd (Chan 2, 8), both fine used. VF-F.
1885 Large Dragon Thick Paper Rough Perfs 1Cd to 5Cd set (Chan 10-12), unused without gum. 5Cd is fake. Please view. 1878 Large Dragon 1Cd mint and 5Cd x 2 used, 1 Cd toned, all hinged. F-VF. 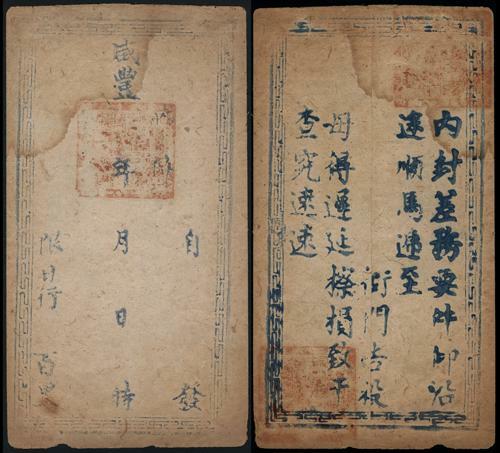 1878 Large Dragon Thin Paper 1Cd to 5Cd complete set (Chan 1-3), all used. VF-F.
1878 Large Dragon Thin Paper 1Cd (Chan 1), unused without gum, LH. 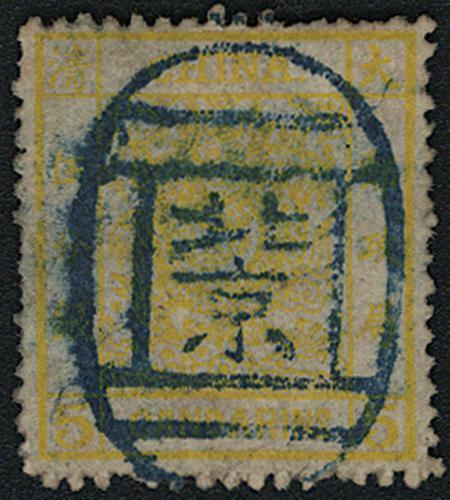 VF-F.
1878 Large Dragon Thin Paper 3Cd (Chan 2), with broken "清" variety, used with Shanghai Customs seal. 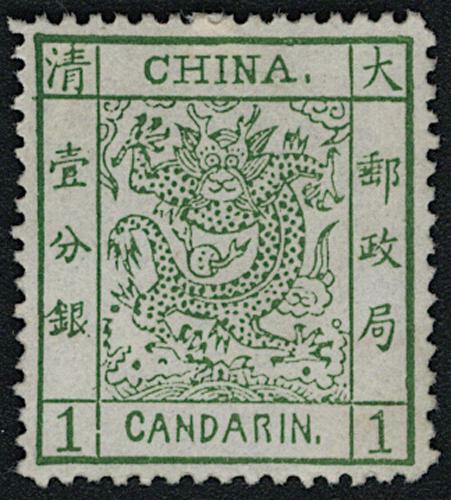 VF-F.
1878 Thin Paper Largon Dragon 5Cd (Chan 3), fresh MH with original gum. Usual minor gum dent. Very Fine. 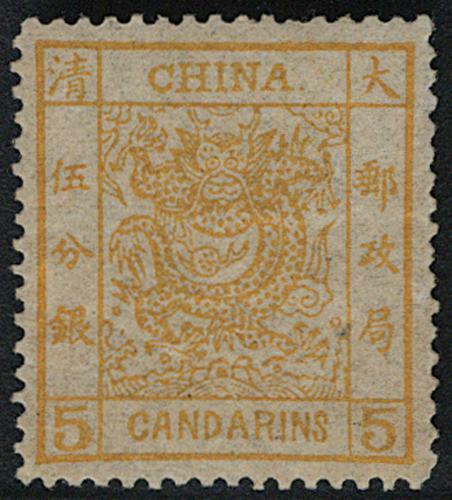 1878 Large Dragon Thin Paper 5Cd (Chan 3), used with clear full bluish Peking Customs seal. VF-F.
1883 Large Dragon Thick Paper Clean Perfs 1Cd (Chan 7), MH with hinged remnant. VF-F.
Books: A Comprehensive Illustration on Covers of Chinese Large Dragons and Collection of China Postal Museum-- Ching Dynasty, both are good reference. Book. In nice condition. 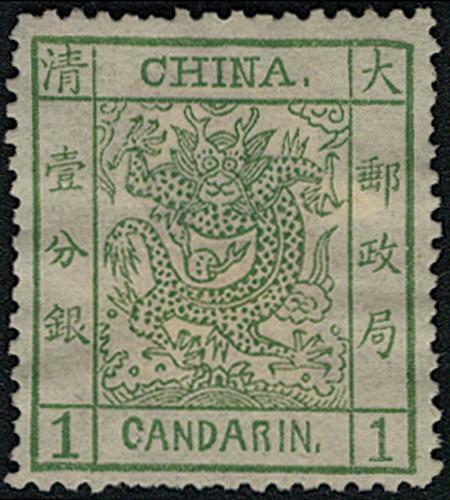 1888 Small Dragon P11.5 Clean Cut Perforation 3Cd (Chan 20), used with rare red Wenchow seal. VF-F.